When the lodge in Tortuguero tells me their van they will pick me up at any hotel in San Jose at around 5am and I live at an hour+ away, getting up at 3am to get there is not appealing, thus when I go to Tortuguero (my 3rd time now) I usually use my Hilton Honor points from an American Express Card to spend the night at Hampton Inn Airport. Well, Hampton Inn was full this time for the night I needed and thus the next closest Hilton Hotel was DoubleTree Cariari, at the Cariari Country Club, also called an airport hotel (5 miles). But it used to be an independent, locally owned unique Costa Rican Hotel Cariari. And I’m glad I couldn’t get in the “cookie cutter” Hampton Inn which is an identical building/room as all Hampton Inns in the U.S. Nothing unique or Costa Rican about it except the coffee and staff! 🙂 And the Cariari is the favorite hotel of my new friends from Durango, Colorado. 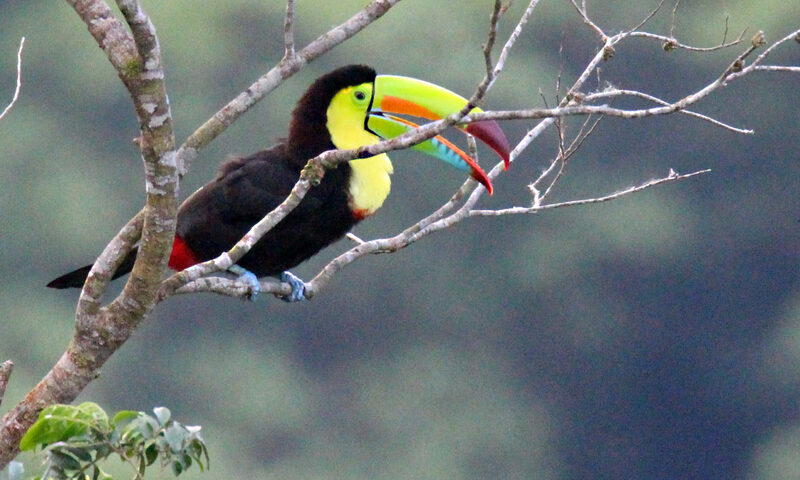 Tomorrow morning at 5:30 AM I leave for Tortuguero National Park on the North Caribbean Coast of Costa Rica. Every leaf is a work of art and I love trying to capture some of it! There are so many things to see and focus on in the rainforest and sometimes a simple leaf is the best eye candy! Enjoy the slideshow! Yesterday, 23rd, was a full day with tour of the park and the night hike here at hotel wildlife refuge – thus I did not get photos all processed until today, the 24th, the anniversary of me living in Costa Rica four years now. I think I have said this before in the blog, but I will repeat that Manuel Antonio National Park is the most visited of all 28 or so national parks in Costa Rica and thus generally my least favorite because it is “loved to death” with too many people (think Great Smoky Mountains National Park in the states with the Gatlinburg-Pigeon Forge mess). My last time here was in 2015 with Kevin Hunter and the park tour was different in that we saw some different animals and probably had a better guide who grew up in the area. We saw squirrel monkeys then which we did not this time nor the parrot snake I photographed on that visit, but otherwise similar. And this time we went to all three beaches in the park, while only going to the one main beach last time. If an animal is spotted by one group, all the other converge on that spot. Too many people! And this time there are now more trails and a really nice series of bridges or elevated walkways through the mangrove swamp, handicap accessible with braille signs! Though behind the U.S. in handicap accessibility, Costa Rica is moving fast in that direction! I go mainly for the wildlife, so that is the main slideshow below, but many people come here for the three different beaches inside the park and pay the $16 admission just to spend the day on one of the beaches, so a shot of each of the three beaches is in the second slideshow. Overall, Manuel Antonio is just too “touristy” for me and I have no desire to return here. The hotel with its own wildlife refuge is nice and I love the views from the hillside, but it too is rather “touristy” and overpriced, so I don’t see myself returning here either. But glad I’ve had all these experiences! The Costa Rica tourists see.